Hi Friends ! 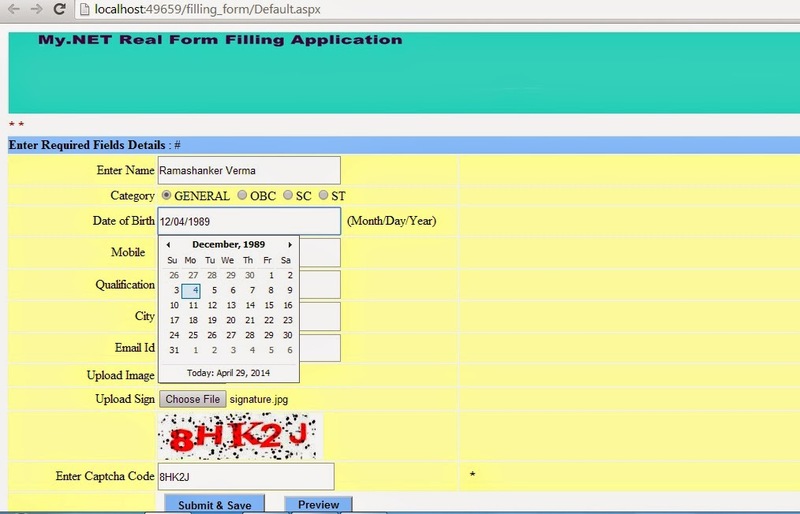 After few hard work,Finally,I have made a Form Filling Application like IBPS or others.You can use this concepts on many places in your web application.I have gathered lots of information about this Form filling application from Internet and users then finally developed this application.I have solved some comments questions of users also in this applicaion .Now days every one is aware about form filling application because they fill online form Normally every day.If you Want to make a Large Project then you have to learn small -small concepts first.I have used many small concepts in this application which i have used in our previous post or others and Built this form filling application.I will show you what small concepts have been used in this application later. 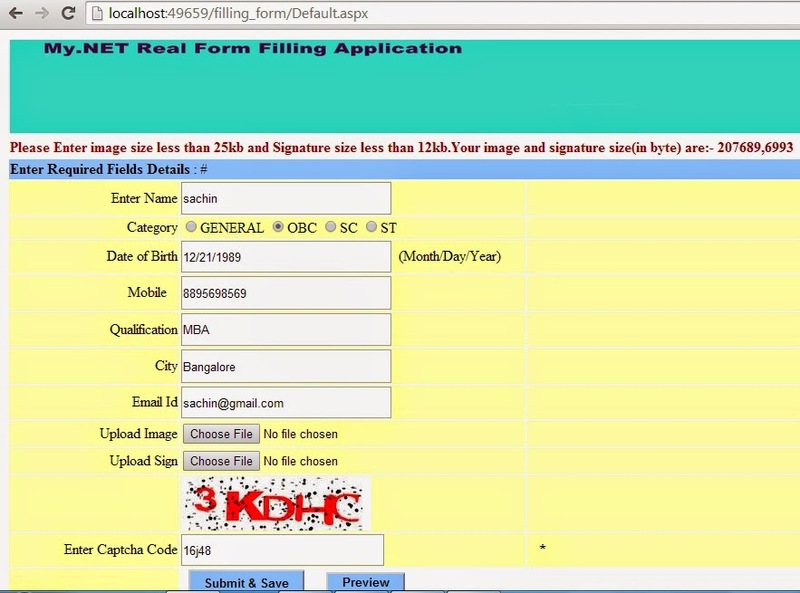 When User Run this Form Filling Application and fill all required fields details. If users fill every details correctly which are already mentioned in Form and After that Press Submit&Save Button then one Registration Number will be generated. If users blank any fields then Submit&Save button will not work because i have used Validation controls. If user upload photo size greater than 25 kb and Signature size greater than 12 kb ,then it will show error. 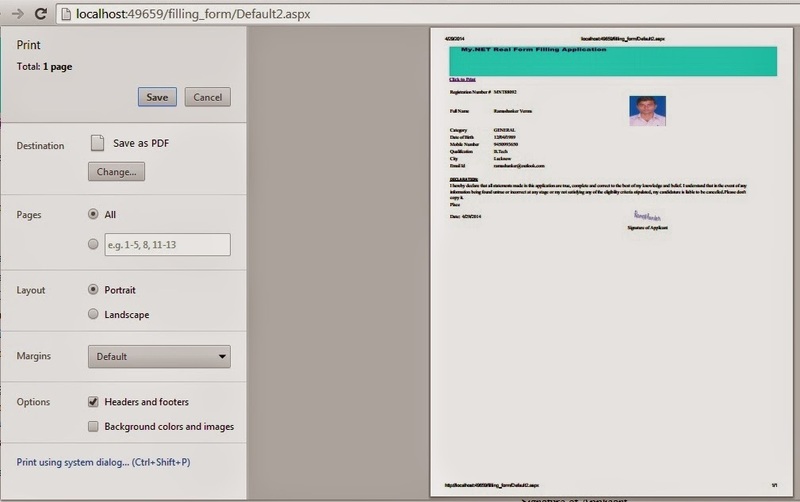 When user press Preview Button,then it will show complete details of user with photo and Signature, which he/she has filled in Form previously . An User can take print out of your application by clicking Click to Print Button on the form. 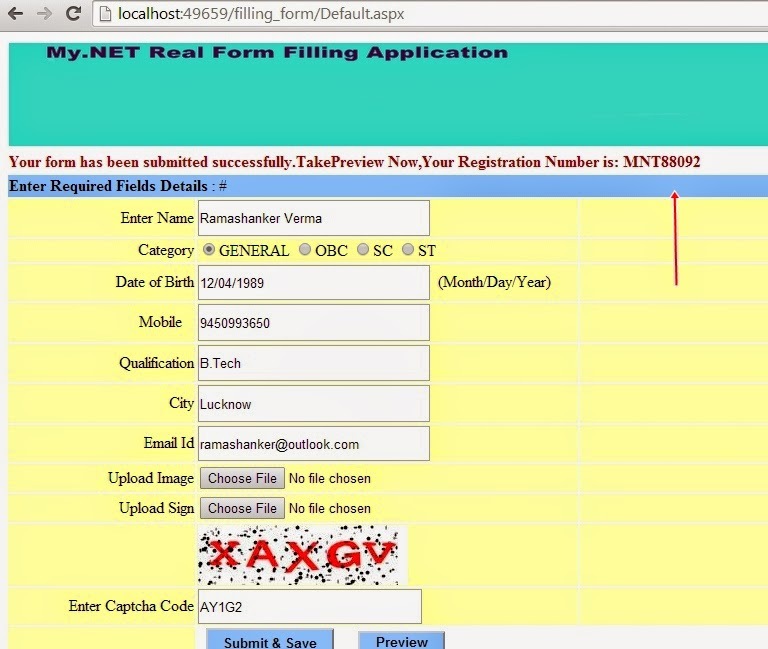 An User can get your Admit Card by this Registration Number. How to select one Radio Button and save selected value in database. 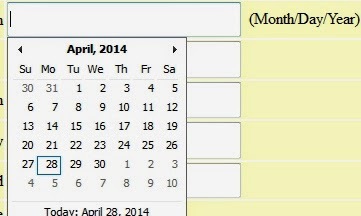 How to link calender Extender control to TextBox. How to use FileUpload control for read and write data to the database. 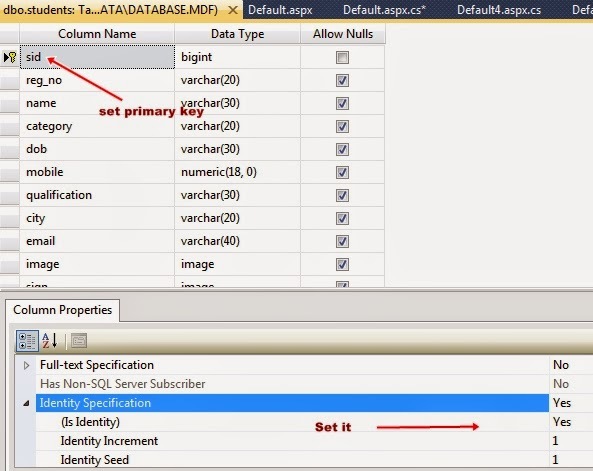 How to configure sql data source. How to add .mdf file on website and create a table with some columns. How to pass control value or variable value from one page to another page using session variable. How to Display image in image control. How to send Registration Number to the user's mail box using c#. How to insert image in database and display it to image control. How to display current system date in label control. How to print any asp.net application using java script. How to allocate memory for any uploaded image in array. How to put restriction in image size when any user upload your image using FileUpload control. Create a admin page by using Form Based Authentication Technique from here. Add a data List control for edit ,update,delete and cancel the clients records here. You can make profile page for every user like Facebook. Note:- You can use Master page instead of this technique. First i have generate a unique Number and store it into Label 2 control. After that select one Radio Button value and store it to a 'cast' Variable. After that ,i have allocated memory of array for image size, signature size and Read its size value. After that i have checked whether image size is 25 kb and signature size is 12 kb or not.If user Upload any image greater than 25 and 12 kb then it will show error.i will show you it in below output section. After that created a sql connection strings for save the controls and variables values to the Students Table. After that Stored required fields(controls and variables) values to the session variables. Session variables basically are used to transfer the values from one page to another page.For More Here. After that send Registration Number to the respective user's mail box after submitting the application successfully. Note:-Please put your gmail id and password in c# code section ,otherwise it will show some error. Note:- Put print button codes where it is suitable for users. //we have to typecast to byte before feeding it to BinaryWrite method. Description:- Why we use default3.aspx and default4.aspx form ? In this page ,i have written the c# codes which is used to fetch the image from student table with help of registration number.Here i want to receive image as an URL formt because image controls take values in URL format. I have passed registration number value by session variable to this page(default3.aspx and default4.aspx) .you can use query strings also for this operation. Note:- First set Starup page as default.aspx otherwise it may show session variables error.Means Run default.aspx page first. Step 17 :- Now press Submit&Save Button -->One Registration Number will be generated and displayed on the top of the page as shown below -->and One registration Number will be sent to your email id. Note:-Check your spam or Junk folder also if you don't see it in your inbox. Note :- Use Google Chrome Browser.It may better than other browsers. You can easily print and save the application as .PDF File. Check this PDF File here. First Download this whole application from bottom and Extract it-->Copy this whole file (cltr+c). Now open your visual studio --> File --.New --.website -->Select ASP.NET Empty website -->OK -->Now open Solution Explorer -->Right click on project -->Paste this whole application which you have copied previously. Now first Open Database.mdf file --.if it is showing error -->then delete this whole Databas.mdf file (otherwise no need to follow next steps) -->Now add another Database.mdf file -->Create New Table students with same column name as mentioned in step 8. Now Run the application-->then you can run this application successfully. Note:- Suppose you want to build asp.net application for any organization then you have to follow two this which are helpful for security purpose. You have to change your TextBox ,Label ,FileUpload and others like this TextBox1.Text --change--> mytxt or Label1.Text --change --> lbmsg similarity follow other also.I have not changed it in post because user can understand this easily. Use parameterized connection strings in database connection always. Others security features also available but it is not free.So you have follow only above two technique. How to display image in Picture Box and save in database easily in windows forms application. Please share this application and put your valuable comments.If you have confusion in any steps ,you can ask frequently.I will help you definitely . That's a good tutorial very help full. thank u !!!!!! How to make a crystal report in any asp.net application? hI Priya ! I have not yetvwritten any post on crystal report.So you have follow below link. dear i want to build an exe file in vs 2012 with c#. Hi Sanaullah ! All steps will be be same in vs 2012 Read Below link. 1.) use correct connection string name(Sql server name). 2.) don't assign string value in integer(meane use correct textbox for correct database column) . 3.) close the string after finish the operation. You can try different connection strings from below link. Nice Post, Its really helpful for ASP .Net beginner. Thanks for posting this. This error means,you have not set correct parameter in your table column,suppose you want to insert a string value in integer data type column in your table,then it will be shown object reference is not set to an instance of an object. here your problem is same. 1.) first check number of fields in your form is same in your database table or not which you want to save in your table. 2.) Data type of each fields in your table should be matched correctly. This means,some problems in your conection codes,check your data types and other codes also.